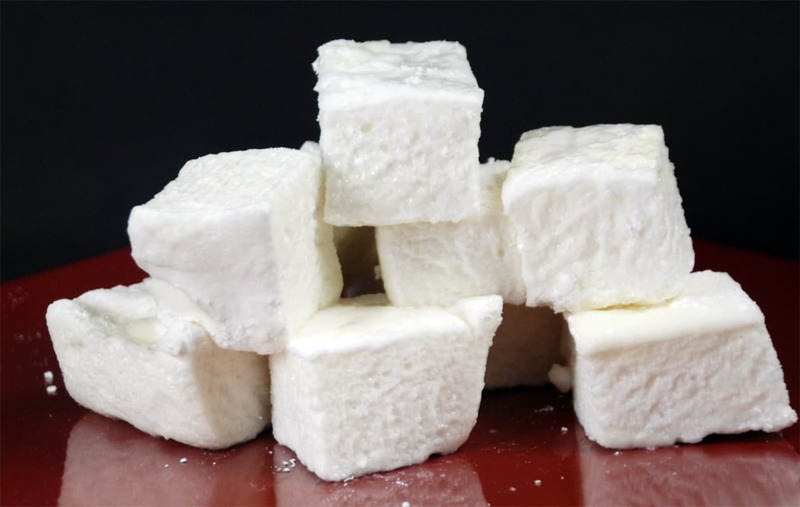 These marshmallows use gelatin to create tender, fluffy marshmallows. You can mold the marshmallows on an acetate sheet that has been sprayed with Pam using pastry bars, on a sheet pan, or in a baking pan. You can flavor these gelatin marshmallows with many different flavors. For these we use the classic vanilla flavoring in the form of vanilla extract but any extract like maple or orange are also great. You can also use strongly flavored liquids in place of the water. Things like blueberry tea, coffee, or even curry make for very interesting flavors. Prepare a 13" x 9" baking pan by spraying it with Pam. Combine the cornstarch and powdered sugar and sift some of the cornstarch mixture in the pan. Pour the marshmallow mixture into the pan and spread it out evenly. Sift the top with some of the cornstarch mixture. Let the marshmallow set for several hours, preferably overnight. I've found the best way to cut the marshmallows into squares is using a lightly oiled rolling pizza cutter, which I first heard suggested by Alton Brown. However, using a lightly oiled knife works well, as do kitchen shears. You can also use lightly oiled cookie cutters for unique shapes. Marshmallows are a favorite food of children everywhere. 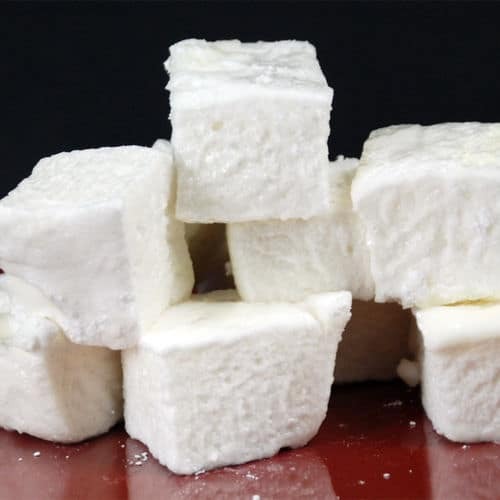 These homemade gelatin marshmallows are so much better than store bought that there is really no comparison.